Love is in the air this Valentine’s Day– and let’s just say we fell hard here at NEXT! Ad Agency! We absolutely love all that social media has to offer for businesses — and we want you to love it too! Rather than just being another brand, you get to establish a voice/brand personality, which then leads to establishing relationships with your clients/customers. Too often nowadays people think that businesses are just that—businesses.But, what a lot of business owners fail to realize is that the modern consumer doesn’t want a one-way street of communication — they want to know the brands and companies they’re paying for; they want to ask questions and interact with you; they want realness. Social media is the perfect way to showcase that “realness,” whether it’s through fun and lighthearted social posts, responding to comments, messages and reviews, or anything else that makes it known that there’s an actual person behind the screen and the business. 2. You’re able to be informative, while staying relevant. Social media platforms are great because they allow that real-time interaction with clients/customers that you don’t get based off of a traditional website, or any other traditional marketing platform. You’re able to showcase your expertise in your industry, while also getting creative and crafting your page to embody not only who you are as a business, but what your customers/clients want to see from you. Social media marketing provides you with amazing analytics and data on your audience — who they are, where they are, what they like, and so on. All of this detail is what sets social media apart– you get to know your audience, and therefore you can tailor your approach to fit the needs of that audience whether that be through posts, articles you share, or ads you run! Social media is great, especially in this mobile-friendly world that we live in today. Nearly everyone is on social media, whether it be Facebook, Instagram, Twitter, LinkedIn — the list goes on an on. These same people are also on their smartphones for a good portion of the day. Social media allows you to showcase your business in the easiest of ways– by popping up right on someone’s phone. As a potential client or customer is mindlessly scrolling through their feed, relevant and eye-catching content sets a business apart from the crowd in the “virtual city” that is social media. If your content is relevant and interesting, everything your clients/customers need to know about you is right at the tip of their fingers! The accessibility of social media provides endless opportunities for your ideal audience. theirs! The flow of content on social media cannot be matched by any traditional form of advertising or marketing. Having your clients/customers be able to spread the word about you is priceless. By creating personal, relevant, and engaging content for your social media pages, you are opening doors for your business to grow and to reach potentially new clients/customers. Ahhh, the marketing term that has been drilled in our minds since school – target market/target audience. Let’s say it louder for the people in the back– targeting is everything! An amazing tool that social media allows you to use while advertising for your company/business is getting your ad out there only to people who want to see it — sounds like a miracle, right? Social platforms have a ton of information about everyone that uses them – where they live, what brands they like, what services they’re interested in, where they are located — you name it! Social media also allows us to use these tools to specifically reach those people when we are creating an ad, meaning, right from the get-go you know that you’ve already weeded out anyone who’s not interested. This varies from traditional marketing and advertising methods such as, let’s say, print: You run an ad, you hope the right people are going to see it by happening to pick up the publication that you’re featured in, you spend a lot of money, and you’re still not 100% sure of the results. Social media advertising gets rid of all of that nonsense and gets right to the point — you are able to see how each and every dollar is being spent and can trust in the fact that your campaign will only be going out to individuals who have already expressed some sort of interest in your field. Shh, this is our little secret! Well, there you have it folks! At NEXT! 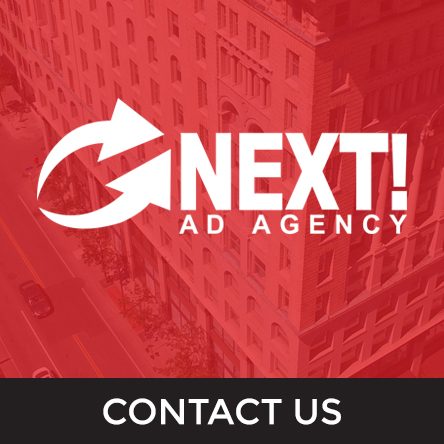 Ad Agency, we absolutely love what we’re able to do for businesses across the country. Social media is a powerful tool– it’s so important to make sure that one understands the endless possibilities that exist for businesses when they jump on the social media train. Let our team share the social media love with you and your business! Contact us today at 585-427-0020. Social Media: Can I Share That?